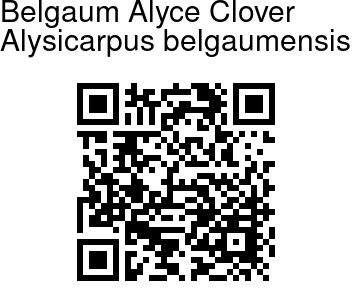 Belgaum Alyce Clover is an erect annual hern, growing up to 30-50 cm tall. The species name is after the district Belgaum in Karnataka. The stem is hairy, with a few rising branches. Leaves are 4-10 cm long, 2-3 cm broad, oblong, pointed, heart-shaped at the base, smooth, net-veined on the upper side, dense silky on the underside. Beautiful pink flowers, shaped like pea flowers, are borne in dense racemes at the end of branches and in leaf axils. Spike can grow up to 20 cm long. Flower stalks are slender, 1-2 cm long. Sepal 1 cm long, hairy, lance-shaped. 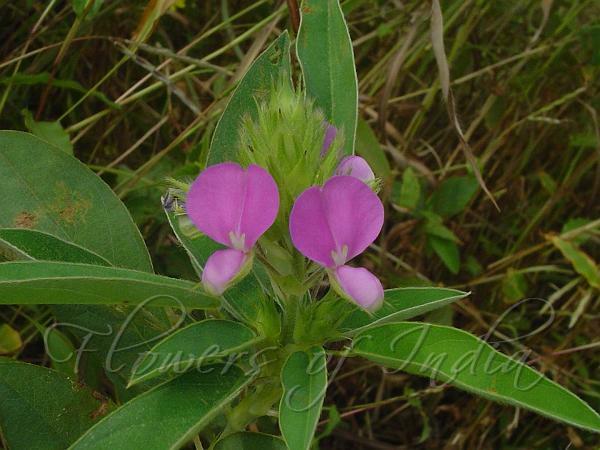 Flowers are rosy, with the standard petal 1 cm across, obovate. Flowers open in pairs, starting from the base of the raceme. Flowering: October. Identification credit: Neil Soars & Shrikant Ingalhalikar Photographed at Khandala & Satara, Maharashtra.